In jail since 2005, barred from contesting polls, the RJD strongman was seen as having lost his influence; now frequent visitors and ‘durbars’ inside, series of murders outside throw the spotlight back on him. The morning after Hindustan’s bureau chief Rajdev Ranjan was shot dead, Siwan was noticeably quiet. The opposition had not called for a bandh, tea stalls and paan shops were without the groups that usually discuss an event of this scale, and shopkeepers near the murder spot denied they had seen anything. And when asked for Rajdev Ranjan’s address, most people said they did not know. Ranjan, who was shot on May 13, had covered crime and court reports relating to jailed RJD leader Mohammed Shahabuddin. Five local youths have been arrested and police said they had been hired by supari killer Laddan Mian, whom they described as close to the former MP. Police are now looking at call details of at least 40 phones to establish a connection to Shahabuddin. In Siwan town, the pucca house Rajdev had built was locked Saturday. Here, too, no one seemed to know where the family had gone until a shopkeeper, who knows the family well but wouldn’t give his name, finally directed The Indian Express to the family home home at Hakkamgaon on the town’s outskirts. “Everyone knows who killed Rajdev but who can name him?” said Rajdev Ranjan’s elder brother Kalicharan. He has built his pucca house with a lifetime’s earnings. At one end of the house hung a cage with a parrot. Paddy sacks were piled near the entrance. Shahabuddin, 49, whose crime record goes back to 1986 when he was a teenager, entered politics in 1990 as Lalu Prasad sought to tap young Muslim leaders to build an M-Y combination. MLA in 1990 and 1995, MP four times between 1996 and 2004, he won on RJD and Janata Dal tickets until he was barred from contesting polls following his conviction in 2007 in a murder case. Many in Siwan used to be terrified of his men for alleged extortion demands and violent attacks on political opponents, particularly of the Left. The reign appeared to have ended after his arrest in November 2005, with new chief minister Nitish Kumar taking over on the promise of restoring law and order. A special court inside Siwan jail started to try Shahabuddin for 18 cases of murder, extortion and under the Arms Act. His political clout dwindling, he fielded his wife Heena Shahab from Siwan but she lost in 2009 as well as 2014. In 2014, Nitish joined hands with Lalu. That September, the two leaders addressed a meeting in Chhapra for a bypoll. With them was Heena, sharing the dais with Nitish for the first time. She was seen whispering into Nitish’s ears. He looked expressionless. In the months that followed, Shahabuddin was allowed more visitors. These meetings soon turned into durbars where he would listen to people’s grievances, jail sources said. Social Justice Minister Abdul Ghafur went to meet him in jail recently. CM Nitish did not take any action against the minister but the jail superintendent was suspended. Bhardwaj said he is relieved Shahabuddin was shifted to Bhagalpur jail this month. “Since he had not faced any trial since December, he had to be shifted to a central jail as per the jail manual’s rule on life sentence convicts,” Bhardwaj said. Since June 2014, three murders in Siwan, including that of Rajdev Ranjan, have been linked directly to indirectly to Shahabuddin. That month, Rajiv Roshan, 34, was killed when he was coming home on a motorcycle. Shahabuddin and his son Osama have been named in the murder case. Rajiv was a brother of 2004 murder victims Satish and Girish, which is now known as the acid attack case, and for which Shahabuddin is serving life. Gangsters had been demanding a cut for “settling” a dispute between the family and one of their tenants. Faced with resistance, the gangsters kidnapped the three brothers, drenched Girish and Satish in acid and shot them dead. Rajiv, who escaped, was a eyewitness to the case and was murdered ahead of testifying. In November 2014 came the murder of Srikant Bharati, press adviser to BJP Siwan MP Om Prakash — who had defeated Heena in 2009 and 2014. 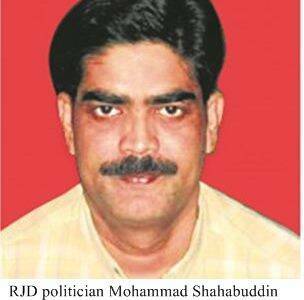 Shahabuddin’s aide Upendra Singh, the RJD leader, has been named as conspirator. BJP leader Sushil Kumar Modi said with Shahabuddin elevated to the RJD’s top decision-making body in its national executive, one could guess the clout he holds. Modi dared Nitish to get Shahabuddin out of the RJD national executive.